The first process in this example is drilling straight holes also called plunging. Typically, end mills are not the best tools to use for plunging unless the geometry of the end mill provides for this machining operation. The method I elected to use is pecking since the aluminum chips can be ejected more easily. If pecking were not used, the end mill would produce too much heat and the chips would melt in the cavity of the hole, potentially causing the end mill to freeze in the hole and break. The next machining operation is profile cutting, or cutting in a horizontal fashion along a path. Cutting without a fluid requires a machining method that ensures the proper temperature of the cutting tool (an end mill) and the proper temperature of the material at the cutting position. Aspects of machining that must be considered for dry cutting is the feedrate, spindle RPM, and depth of each cutting pass. The feedrate and RPM are intrinsically related. Feedrate is the velocity at which the end mill moves across the material and the RPM is how fast the tool is spinning. If the RPM is high, the feedrate must also match so that the tool will not cause too much heat. The depth of cut per pass is determined by the load against the tool during the cutting process. The depth per pass is generally determined by the manufacturer’s suggestion and the ability of the machine’s motors to provide the torque to overcome the load against the tool. If these considerations are not carefully determined, undesirable results may occur, such as: increased tool wear, aluminum melting causing the tool to become clogged with aluminum chips and the edges of the aluminum showing a melted, gumming appearance. The specifications I used for this dry cutting process is: 100 IPM (inches per minute) for the feedrate, 18,000 RPM for the spindle and a depth per pass of .05 inches (just shy of a 16th of an inch) (about 1.27 mm). The end mill in use is a 65-026 which is a ¼” cutting diameter with a single flute that is recommended for wood, plastics and aluminum. The 100 IPM feedrate was derived from the chipload formula of feedrate in inches per minute equals the spindle RPM multiplied by the number of flutes and then multiplied by the chip load. The chip load for cutting aluminum with this tool is a range from .003 to .006. That range gives a result of 54 to 108 ipm. The resulting chip from the cutting process should be scrutinized to determine If the feedrate and RPM were within an acceptable range. The chips should be the size of the depth per pass by the length of the cavity of the flute and by the chipload thickness that was shown in the formula. The thickness of these chips are .0135 which is a bit thick as per the chip size recommendation. Even though the edge finish is acceptable for my purposes, a slower feedrate may create a better edge finish. The hold down for the aluminum extruded sheet is important. Chatter and vibration should be avoided as much as possible. In this example, we used screws to hold down the aluminum into our spoilboard. To keep the part being cut out stable, holding tabs were used. Holding tabs are a bridge between the part being cut out and the surrounding aluminum. After the machining is complete, the part is removed using a multitool to cut through the holding tab. A grinder or file is used to remove the remnants of the holding tab on the edge of the part. 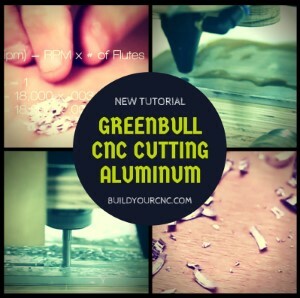 The next example cutting aluminum introduces a wet technique which uses a cutting fluid. The cutting fluid will remove much of the heat to decrease the tool wear. Since heat is the major cause of tool wear and failure, the cutting fluid helps maintain a tolerable temperature. In our experience, the cutting fluid does not show a difference in the resulting finish along the edge of the part. However, the cutting fluid may improve the edge finish at slower feedrates with the same RPM to achieve more cutting action along a shorter length where dry cutting would melt the aluminum with this slower feedrate. As shown, the cutting fluid is sprayed onto the aluminum surface using a bottle with extreme care. The smoke seen during the cutting process is the burning of the cutting fluid which shows how hot the cutting process with aluminum can be. For both the dry and wet example, we use the climb cutting direction which provides the best edge finish as opposed to conventional cutting direction. The climb cutting direction takes into consideration the spindle rotation direction or the direction the tool is spinning. Using this method, the finished edge of the actual part will exhibit the end mill essentially spinning along this edge like the tires of a car spinning out on pavement. Conversely, conventional cutting direction is like a car spinning out in reverse, but being pulled by another car in the opposite direction. Both the wet and dry cutting examples exhibited the same chip size. This demonstrates that feeds and speeds coupled with the RPM determine the chip size and cutting wet is a method of cooling the end mill during the cutting process. Both wet and dry cutting examples also exhibited the same edge finish and appearance.